Just days after the Ohio State Buckeyes placed head coach Urban Meyer on administrative leave, fans of the Buckeyes organized a rally outside Ohio Stadium to show their support for the head coach of their beloved football team. On Monday, hundreds of Ohio State fans showed up with signs taking aim at ESPN in general, specific ESPN personalities (particularly noted Meyer critic Paul Finebaum and 6 p.m. SportsCenter anchor Sage Steele, who co-hosted Friday’s edition that featured former Buckeyes assistant Zach Smith discussing the allegations of domestic violence against him), and other members of the media, particularly currently-independent journalist Brett McMurphy (who broke the story that started all this on Facebook). As a quick refresher, Meyer is being investigated by Ohio State after McMurphy reported the head coach was much more aware of alleged domestic abuse by Zach Smith than he had initially claimed. After initially denying any knowledge of 2015 domestic abuse allegations against Smith at Big Ten Media Days and suggesting he was in disbelief over how such a story could be developed, Meyer has now admitted not only was he aware of the situation but also reported it up the chain of command at Ohio State, thus attempting to shift the blame on athletics director Gene Smith (no relation to Zach). Zach Smith has also said Gene Smith was aware of the situation. With the investigation now ongoing and expected to wrap up within the next two weeks before any official decisions are made by the university president and the board of trustees, some Ohio State fans organized a rally Monday to show their support for Meyer. The organizer of the rally addressed the crowd assembled outside Ohio Stadium to make it clear the rally was not to reflect on the actions of Zach Smith, but laid out the reasons to be upset with…Finebaum? Beyond that, some posters seen at the rally took some shots at ESPN in general, and that makes some sense; even though ESPN was among the last outlets to even touch the subject last week following McMurphy’s report, and took plenty of criticism for that, they are still the most visible media outlet covering anything breaking in the college football and sports world, and they’ve covered this extensively since then. 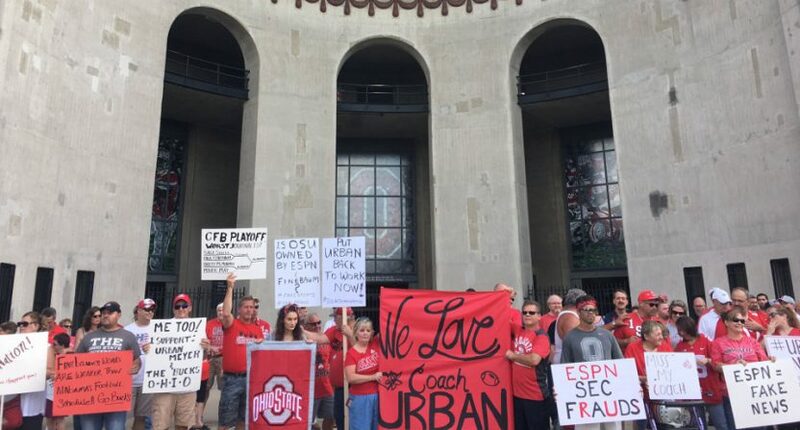 One sign asked “Is OSU owned by ESPN & Finebaum?” I’m not exactly sure how to answer that one, other than to say “No.” Another sign pulled out a “Fake News” reference regarding ESPN. Beyond that, one arguably creative fan put together his own “Worst Journalist” bracket and had McMurphy coming out on top of a four-team field, which included Finebaum, long-time Ohio State hater Mark May (who has largely fallen off the face of the earth since ESPN laid him off last April, but did come back to Twitter for the first time in months Thursday to tell Meyer to “stop digging!”), and Steele. My goodness. That may just be the worst sign. This guy probably thought about what he was going to put on his poster all weekend, and he still went ahead thinking this was the best he could do. As if things were not bizarre enough, Stacy Elliott, the father of Dallas Cowboys running back and former Ohio State star Ezekiel Elliott made an appearance to lend his support for the Meyer cause. And it’s not like he was just around the corner either. He came in from St. Louis to be there. Stacy Elliott, Ezekiel Elliott’s father, drove in from St. Louis to attend the rally. Remember, Ezekiel Elliott was accused of but never charged with domestic violence by a Columbus prosecutor due to a lack of evidence to pursue charges. He wound up serving a six-game NFL suspension last season after a long, drawn-out legal battle. (Oh, and former SEC chair/U.S. attorney Mary Jo White, who’s leading the Ohio State-commissioned investigation into Meyer, was on the advisory panel that investigated Elliott.) But wait, there’s more. Somebody had a good sense of humor, because a delivery man from Papa John’s showed up with some pizza at the rally. (Thanks to Karen Howell from Mississippi.) Given the current headlines surrounding Papa John’s and founder John Schnatter, there is some comedy here. We all know Meyer is a fan of Papa John’s, after all. Now that the rally is over, it is worth a reminder that the majority of Ohio State fans are likely good and fair-minded people. These people showing up at the rally are entitled to their opinions, even if the show of support may ultimately do more harm than good for the image of the program and the collective fanbase. It is also important to remember that every fan base in the country has fans that will go to battle to defend their favorite team, program, coach or player. It happened with Penn State fans and Joe Paterno. It happened with New England Patriots’ fans aiming their ire at Roger Goodell over Tom Brady’s cheating. It happened with Baltimore Ravens’ fans and Ray Rice. It happens every single time something bad happens to someone associated with a team, and it will certainly happen again. The vocal minority of fans will take the spotlight and create the narrative while most fans sit at home with better things to do. Right now, it is Ohio State fans getting a negative picture painted about them in how some are responding to the ongoing Meyer situation with this rally, but it may be other fanbases down the road.